Posted on April 18, 2009, 9:34 am, by francesco d'orazio, under music, opera, theatre. Tod Machover is working on a new theatrical show at MIT Media Lab Hyperinstruments that is going to revolutionize the way opera is produced. Simon Powers was a great man, a legend who wanted to go beyond the bounds of humanity. He was a successful inventor, businessman, and showman. During his life, he accumulated unimaginable wealth and power. He is the founder of the System, a human organism material experiment which investigated the transduction of human existence into other forms. The stage will represent Simon Powers’ house, but this room will gradually reveal itself to be a vast, interconnected, intelligent system— Simon has turned himself into the room, or vice versa. To accomplish this effect, we will design and build a completely new, modular structure that will allow the room itself to change its shape, undulating, vibrating, pulsating, or pounding. The physical environment will consist of a vast array of interlocking forms— derived from loudspeaker-driver technology— that are independently controlled by motors and hydraulics. The System is rapid, lightweight and silent, and can be programmed to create sculptural images, moving patterns, and even human-like gestures and expressions. Embedded in The System will be a number of image display surfaces and sound-producing elements, capable of showing the disparate, fleeting thoughts and memories from Simon’s inner world. 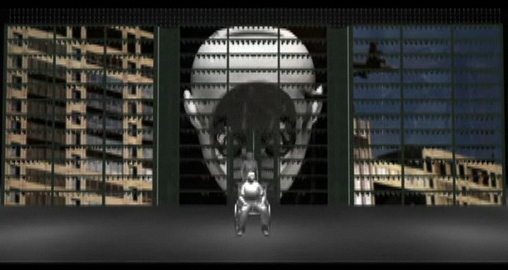 Also essential to the production of Death and the Powers is an overall technical design that will allow the opera to be installed, rehearsed and performed in extremely diverse performance spaces – from theaters to black boxes to opera houses to galleries to even more unusual venues – with a minimum of logistics or expense.